I first started getting this giveaway lined up for you guys back in September. That month way back when was also Disaster Preparedness Month, which is why this giveaway was so timely and fitting. That may have passed, but the need to stay prepared has not. Seeing as how part of the reason I wasn't able to get to this sooner was because Hurricane Sandy hit my area and then was followed up by a lovely nor'easter, I think now is just as fitting as ever. I have been talking to people on a daily basis now who are still without power or are scared they may lose it again at any time, and they simply aren't prepared for it. One of my biggest concerns throughout all of this were the people who were without power. With winds being upwards of 45+ miles per hour....and the temperatures dropping below 30.... those people without power were also without heat usually. Ouch. An easy source of heat is fire obviously, which is how this giveaway comes into play. In addition to all the basics like food and water, having a few different sources to create fire are pretty key. Zippo sent me their emergency starter kit to try out and is offering up one for this giveaway, too. It doesn't rely on a flame in order to start a fire. Instead, it's a flint wheel plus waxed tinder sticks that are stored inside a waterproof case. 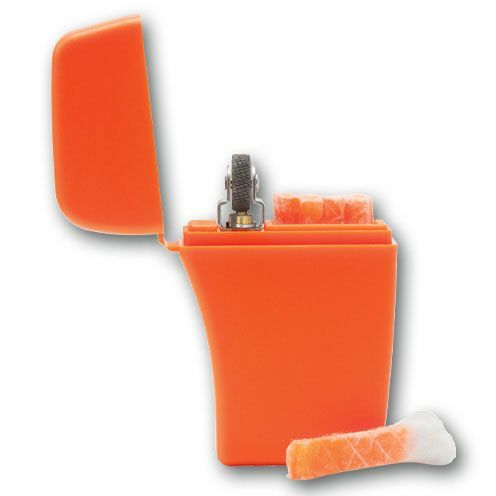 This way, when you realize you don't have any working lighters or that your matches have gotten wet, you still have a source for fire. It may sound simple, but it could make the difference between life and death. So how do you get yours? Easy. Oh! And if you have never used the Rafflecopter widget before, you do *not* need an account. That little button that says "log in" is only for you to put your name and email address in so that I can contact you at the end if you win.